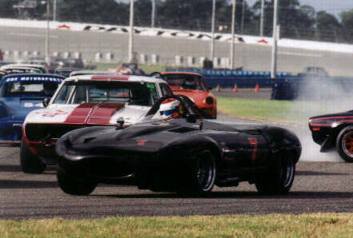 Terry's Jaguar racing team headed down to the world famous Daytona International Speedway to particpate in the Brumo's Conternental Historics on the 2.5 mile road coarse with their teamates from Predator Performance Racing. The track start line is the same as they use for NASCAR Winston Cup racing but then you make a hard left after NASCAR pit outand negociate the 6 turn infield coarse before being shot out on to the banking in NASCAR turn 1,you then put the pedal to the metal untill you get about 3/4 of the way down the backstaight then its hard on the brakes through the chicane and back out on to NASCAR turn 3 and then keep your foot to the floor untill you hit start and finish line at over 170 mph then its hard on the brakes ready to do it all over again.....sounds like fun. The first race of the weekend was the Vintage enduro for David Hinton in the rapid XK 120 coupe dubbed the worlds fastest XK120.After qualifing 4th behind the Brumos 914's of Hurley Haywood and Bert Flagg David was really optermisitic about his chances for a podium finish in this 60 plus car field.As soon as they gave the 5 minuite whistle the heavens opened long enough to drench the entire track.David decided to give it a go anyway.With another great start the red 120 led the pack to the first turn but as soon as they started through the infield the Porsches started chargeing to the front. After spinning out on the banking twice David decided to take it easy and just finish the 1 hour race instead of spending the winter doing bodywork. With a 1st in class David was awarded class V3 Rolex Endurance champion. Next up was the group 3 sprint race. The field of 50 cars started their pace with Craig Sagon on the Pole in his oh so fast Chevy Camaro and next to him was one of the Brumos Porsches, starting 3rd and 6th was Larry and Trent in their Terry's Jaguar powered XKE's. As soon as the green flag dropped the Camaro pulled out several car length's on the rest of the field but the Jags started making there moves in the infield after the first lap Larry was in second place behind Craig and Trent was in forth behind the Porsche. The new Predator Semi was the grandstand for the next 6 laps as Trent and Larry made their way to the front of the field. With 3 laps to go Larry and Trent had pulled away from the rest of the field and were swapping the lead back and forth several times each lap to the excitement of the crowd. 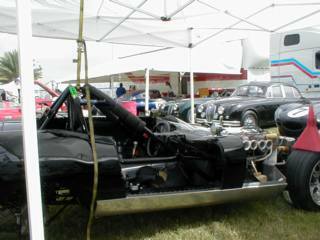 The race was won just by Trent Terry in the black XKE roadster over Larry Ligas in the blue and red XKE coupe. The group 1 sprint race had David Hinton on the pole in the red Jaguar but starting next to him was the very quick Royale of Lee Buell. David led the field for the first 5 laps until he gave the old 120 a bit to much power coming out of the International horseshoe before he knew it Hinton was doing donuts through the infield and losing the lead to Lee in the Royale. David gathered the car back up faced it in the right direction and began chasing down the little green Royale. With just two laps to go David caught back up to it and finished first by .002 of a second. The last race of the weekend was the Rolex Classic GT enduro in which Larry Ligas was hoping to take a top 5 finish in the end of year overall standings. Larry got off to a great start and was up to 4th overall within a few laps and was making moves on third place until a quick spin moved him down the field. After the mandatry 5 min pit stop Larry was still in the top 10 overall and first in class. 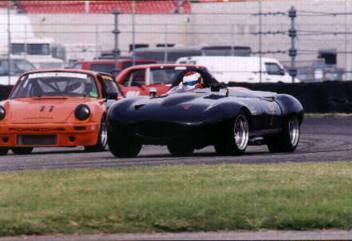 The XKE's brakes really started to fade in the last laps of the race forcing Larry to slow up and bring it home for a first in class finish. Larry was awarded the Rolex sportsmen of the year award by HSR and Rolex watches the series sponsor. Larry ended up 5th overall and 2nd in class for the year.